Santa Barbara, CA (June 1, 2016) …Today, Return to Freedom joined with 38 wild horse advocacy, rescue and humane organizations representing more than 10 million citizens, stand united in calling on the U.S. Bureau of Land Management to make greater use of the humane fertility control vaccine PZP as a way to stave off its “billion-dollar” fiscal crisis caused by wild horse roundups in the American West. 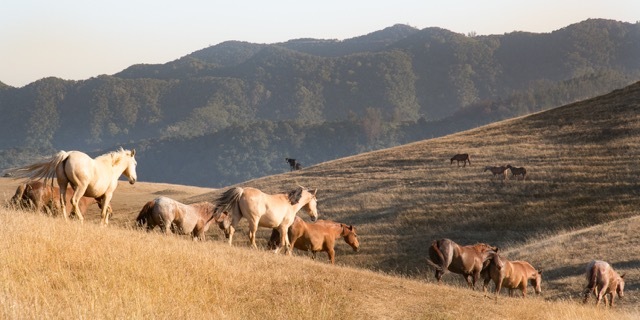 “While we support appropriate use of PZP as an alternative to the tragic and costly roundups and warehousing of fractured wild horse herds, we also hold BLM accountable for creating artificially low population levels for wild horses and burros on public lands designated for their use”, said Neda DeMayo President of Return to Freedom who has used the benign vaccine for 17 years to manage population at their sanctuary. “The agency should be re-adjusting the ‘Appropriated Management Levels” (AMLs) according to the science, without predjudice, not the whims of special interests profiting from the exploitation of our resources.” DeMayo continued. The organizations contend that the PZP vaccine is a cost-effective alternative to costly roundups and removals of wild horses from the range. The call for greater use of PZP comes on the heels of a recent admission by BLM Director Neil Kornze that the current system of roundups is failing. In fact, according to Kornze, the BLM’s policy of rounding up and removing, and stockpiling wild horses in holding facilities is leading up to a $1 billion crisis – the amount U.S. taxpayers will ultimately pay to warehouse thousands of wild horses for decades after the BLM has removed them from the range. Already, 70 percent of the BLM’s $80 million Wild Horse and Burro Program budget is spent on roundups and removals, while less than 1 percent of that amount is spent on long available, humane and effective fertility control. In the last seven years alone, BLM has removed more than 40,000 wild horses from public lands. The agency now stockpiles as many wild horses in captivity as remain free on the range. PZP has been used for more than 25 years in the wild horses on the Assateague Island National Seashore in Maryland. In that time, the herd has been brought to more sustainable numbers and the overall health of horses as a result has improved substantially. In 1990, few horses on Assateague lived past 15 years.Now, many are living 30 years or more. And, because PZP is not permanent, the National Park Service managers can closely control the herd’s population, allowing for increased births as appropriate. Management programs with PZP also have helped curtail and even end roundups in wild horse management areas in the West, such as the Pryor Mountains on the Montana/Wyoming border, McCullough Peaks in Wyoming and Spring Creek Basin and Little Book Cliffs in Colorado. In Colorado’s Spring Creek Basin, no mustangs have been removed since 2011, thanks to a BLM-facilitated public/private partnership for humane management of this herd utilizing the PZP vaccine. In addition, the BLM has committed to bait trapping if, in the future, the removal of some mustangs is necessary to maintain range health. Bait trapping is a far less traumatic capture method than helicopter roundups. Increased use of PZP and a reduction in roundups and removals would also be a boon to U.S. taxpayers, helping to curtail the $1 billion crisis created by the BLM. The public now spends about $49,000 for each mustang that is removed from the range and not adopted. PZP, meanwhile, costs about $27 per darted horse per year. One economic model published in the Journal of Zoo and Wildlife Medicine (Deseve, Boyles Griffin, 2011) demonstrated that BLM could save $8 million over 12 years by using PZP in one herd management area alone. Multiply that by 179 HMAs and the cost-savings reach the hundreds of millions.